Students in Ryan Hacker’s Advanced Sports Medicine class found themselves in the operating room as well as the classroom as they observed medical professionals and their patients. Through a partnership with St. Cloud Orthopedics and St. Cloud Surgical Center, the 13 class members were able to follow a patient from diagnosis to recovery and learn firsthand the details of treatment by a cast of medical professionals. Two of the students, seniors Kelli Loscheider and Kathleen Harthan, followed a man with a rotator cuff injury. Loscheider and Harthan, and the other students, reported on their experience in end-of-class presentations. They shared their step-by-step experiences using graphs and videos to illustrate what they learned. They described in detail the injury, treatment plan, what they observed in the Nov. 19 surgery and how the man slowly recovered. “We got to see what every medical person does,” Loscheider said. The students said they bonded with their patient, even receiving an invitation for Thanksgiving dinner. Harthan and Loscheider also shadowed trainers at athletic events and Loscheider had to cut the sutures when a hockey player got stitched. The project begins with the students attending orientation at the surgical center and by the third week of the quarter, they are watching the surgery. With surgeries and appointments, Hacker estimated students spend more than 30 hours outside of class plus the regular homework for the class. Because of access limitations at the two medical facilities, the class size needs to be small. About 40 students will take the class during this school year. Harthan and Loscheider said the experience helped narrow their choices for college and careers. Loscheider is considering a career as a physical therapist or physician’s assistant and plans to attend the College of St. Scholastica. Harthan wants to be a registered nurse or physical therapist. She’s considering the University of Minnesota, the University of Wisconsin-Madison or the University of Arizona. Advanced Sports Medicine students Kelli Loscheider (left) and Kathleen Harthan explained the details of following a man with a rotator cuff injury from diagnosis to recovery. 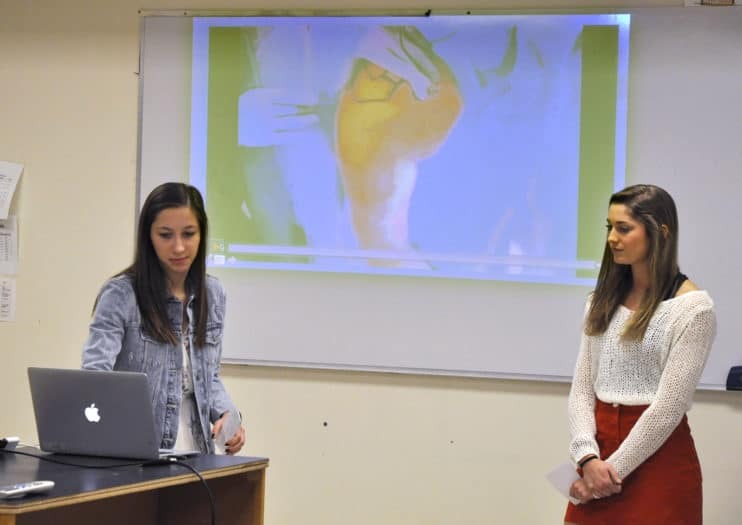 During their presentation for Advanced Sports Medicine, Kelli Loscheider (left) and Kathleen Harthan used videos and graphics to explain the surgery they watched.